From Climate Change to wind farms and even electric cars, it is sometimes a question that needs an answer. In reality a large number of vested interests from WWF to SSE, from Tesla to HS2 have a well refined lobbying process to influence our politicians. From luncheons at the Dorchester to tickets for Wembly and the Five Nations, the ordinary and informed member of the public cannot compete. However many try and Doug Brodie has been trying to inform and educate for years. Here is his latest offering. My updated paper on this subject is available online here. I urge you to read it for the sake of your hard-pressed constituents. To summarise, it explains how the inappropriate so‑called renewables technologies chosen by politicians to supposedly “tackle climate change” are leading our country into a disastrous energy supply dead end leaving us mired in the unviable policies of technically unqualified Greenthinkers. It ponders why the establishment is blind to the engineering realities which dictate that we can never wean ourselves off fossil fuels and sustain our growing, high tech and hopefully globally competitive economy using expensive, intermittent, energy sparse, unscalable renewables, also ignoring the fact that these low productivity technologies are of little interest to most of our global competitors (ex‑EU). The answer is clear from reading any Guardian article on climate change with its echo chamber of irrational, technically blinkered, self‑flagellating readers’ comments. The climate change propaganda put out by that other pillar of the establishment, the biased BBC, is just as shameless. My paper also reviews the status of the climate change debate and shows how the climate risks and fears stoked up by politicians, “follow the money” businesses and scientists who benefit from the scare, anti-capitalist environmentalists and the mostly left‑wing media have been wildly exaggerated. So far I have sent my paper to several ministers and two select committees (S&T and BEIS) but have had just one dismissive reply. That leads me to think that the members of these committees, the government itself and the majority of politicians are sticking their heads in the sand on the scientific and engineering realities of energy and climate policy. Hence this follow-up email to bring this vital issue to their attention one last time. Since then I have noted three items which support my contentions, given below. They run a bit longer than originally intended – I got carried away! – but if you can spare the time to read them there is much to learn that is seldom if ever reported in the mainstream media. I particularly hope you will read the first item on Labour’s 2017 manifesto energy policy as it provides a very useful case study in muddled thinking – it looks as if their manifesto has confused energy with electricity, or they have been inexcusably careless in their wording. Along the way it identifies what could be a major cause of the UK’s low productivity. The second item, which includes a lesson from Margaret Thatcher, is on how the climate change scare has been blown up out of all proportion and what politicians should do about this if they feel concern for their hard-pressed, energy poor constituents, with the added benefit that it would free them from the out-of-control monster they have created for themselves. The third is on the precarious security of our gas supplies and fracking, which Labour, the Lib Dems and the SNP all oppose. The final paragraph asks some of the most critical yet politically dodged energy questions of our times. I put it to you that you are stuck on a climate change treadmill you can’t get off, hoist on the petard of your own climate pseudo-science, painted into a corner by your own untenable climate commitments, chained to climate and energy policies which can only end badly for all of us. The longer you ignore reality, the worse it will get, especially for the poor. Please read on for my objective synthesis of energy and climate facts, all carefully referenced via hyperlinks. 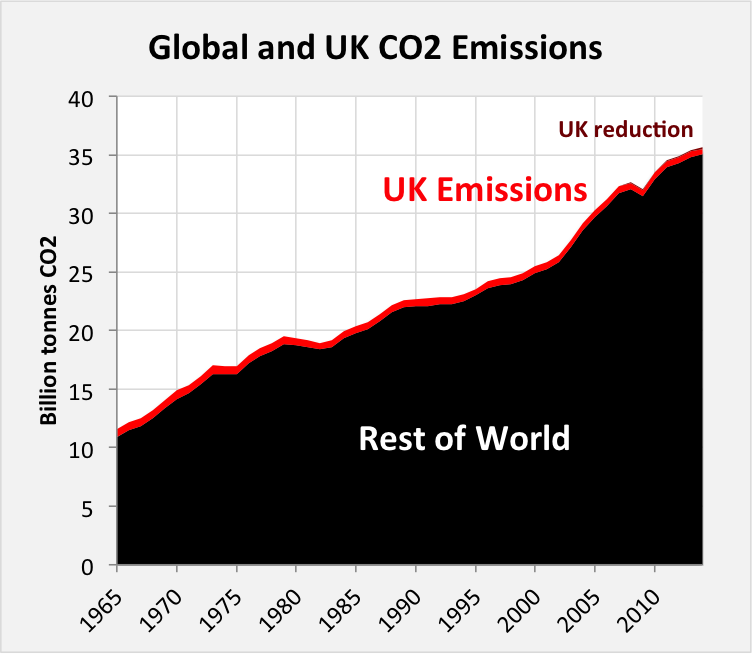 Labour took the easy approach that no expense need be spared, no reasoned justification given nor consent sought to push ahead with the establishment’s futile and ruinous Climate Change Act imperative of reducing CO2 emissions. In a few short sentences of their 2017 manifesto Labour commit to sweeping energy infrastructure changes involving vast expenditure yet this upheaval would have been pointless as it would have had negligible impact on the global climate (explained below) with very little benefit to fossil fuel sustainability (due to using CCS, explained below). All it would have done other than maybe win a few eco-activist votes is make UK plc less competitive and worsen fuel poverty which here in Scotland reached a shocking 39% in 2014 (since massaged down slightly) after a decade of misguided eco‑policies. Yet Labour had the gall (or naivety) to promise that energy costs would be kept “affordable”. The Labour Manifesto 2017 energy policy states that “60 per cent of the UK’s energy will come from zero-carbon or renewable sources by 2030”. Their inconsistently-phrased “zero/low-carbon” reference is to “state-of-the-art low-carbon gas”, taken to mean conventional gas-fired electricity abated of CO2 emissions by use of very expensive, unproven at national scale “carbon capture and storage” (CCS) which they also commit to in their manifesto. So‑called “bonkers” CCS is also supported by the Lib Dems and SNP and the Tories have not ruled it out. Labour’s ambitious 2030 timescale and the lack of detail on their “60% energy sources” suggests that they do not understand the hugely demanding implications of their own policy, as the following simple sums should make clear. Not that the Labour Party is unique in this respect as none of our political parties has ever spelled out what it would take to implement the self-imposed legally binding 80% decarbonisation target of the Climate Change Act: none has ever produced even an outline plan extending to 2050. A first step in analysing Labour’s 2030 energy policy, which is just an intermediate stage of the government’s own 2050 Climate Change Act policy, is to note that electricity supplied roughly 20% of UK final energy in 2016, generated by a mix of fossil fuel and low carbon sources: gas 11%, coal 2%, nuclear 4% and renewables 5% (difficult to use, incapable of deployment at large scale wind and solar were 2.3% and 0.6% respectively). 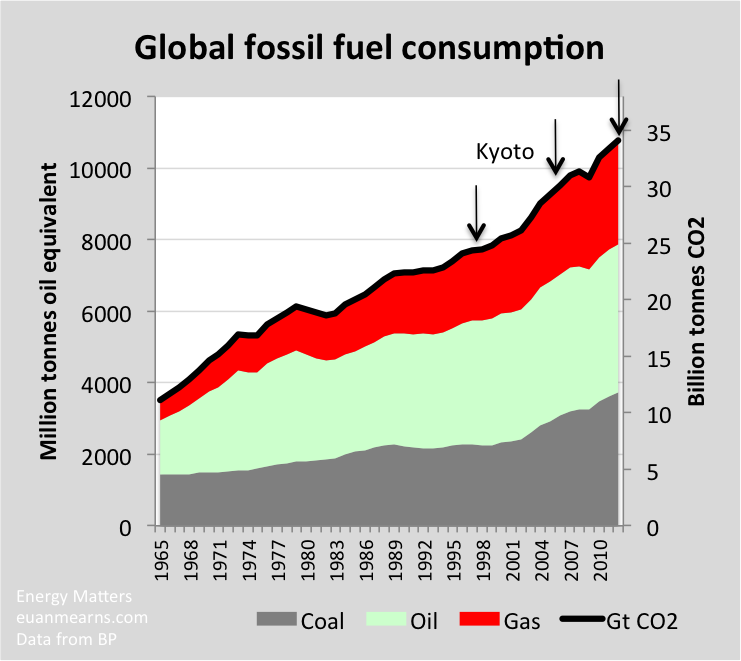 Fossil fuels supplied the energy for the other 80% of the economy. These numbers, which seldom get reported anywhere, are given in the Digest of UK Energy Statistics 2017 (Dukes) and politicians ought to think very, very carefully about their implications for our 80% decarbonisation targets – do the maths, it’s not rocket science. The Climate Change Act, which Owen Paterson MP has estimated could cost up to £1.3 trillion in these times of austerity and Brexit challenge, is about supposedly transitioning from our present heavy reliance on fossil fuels to a sustainable “low carbon” economy but as my analysis shows and as common sense dictates, our ineffectual implementation efforts are infeasible on many grounds, particularly technical and financial. The only feasible, still hugely expensive way to get close to the 80% target would be through a combination of high energy density emissions-free nuclear, which many climate catastrophists such as the SNP paradoxically reject, together with medium-emissions gas for essential balancing (see my main paper for details). Next, a slight complication to be taken into account in converting annualised energy consumption into the capacity needed to supply peak demand. The fossil fuel wider economy copes with peak demand by, for example, supplying more gas to the grid or more fuel to filling stations. Sizing an electrified economy to cope with the peak demands of, for example, winter domestic heating and overnight charging of electric vehicles translates into building more power stations than are required just to supply the annual consumption. The peak demand uplift will be difficult to estimate but for this ballpark estimate I will assume that one unit of electricity generation capacity will support just 0.7 annualised units of the fossil fuel economy (see my main paper for details). Please bear with me on the precision! I will presume that Labour’s intent would be to increase and decarbonise UK electricity generation from 20% to 44% of UK final energy which, assuming approximate equivalence between similar energy types and applying the above 0.7 factor, would allow the fossil fuel economy to be decarbonised by about 17% from 80% to 63% of UK final energy, giving a “zero-carbon/renewables energy sources” total of about 61%. This 17% of the transport, heating and industrial fossil fuel economy would have to be expensively converted (decarbonised) to use the new, expensive low carbon electricity instead of relatively cheap fossil fuels which for the foreseeable future will be the fuel of choice of most of our global competitors (ex‑EU). Based on 2016 data, taking a “sensible” fuel type mix (not too many undependable renewables) and in round numbers, this 2030 decarbonised electricity could require the following: zero coal (the current plan “cooked up over a cup of coffee” as flippantly boasted by our irresponsibly reckless Climate Change Minister Claire Perry is to close down all coal by 2025); a net doubling of emissions-free nuclear (probably the most that can be expected by 2030 given the glacially slow progress to date, 9.5 GW capacity in 2016); a quadrupling of gas-fired electricity (33 GW capacity in 2016, load factor just 49%), all fitted with expensive, energy hungry (10-15% more gas plus system overheads), probably unviable CCS pipelined to undersea reservoirs to store the by-product CO2 without leakage for posterity; and a doubling of expensive, unreliable renewables (36 GW in 2016 with a load factor of less than 30%). Acceptance of severe blackouts when there is no wind and sun in cold midwinter when power is needed most would require only a tripling of CCS gas electricity! A few comments on this presumed fuel mix: The CO2 emissions from gas-fired power stations are not that bad, especially if difficult to balance renewables were to be curtailed, so why bother with expensive, pointless CCS? A mainly nuclear and unabated gas combination makes more sense technically, it would save on finite supplies of fossil fuels by not having to power CCS and could spare us from yet more expensive, intermittent, “sick joke” so-called clean wind power which many studies have shown yields only minor net CO2 emissions savings (this study 2.8%). This would have the added benefit that fewer gas-fired power stations would be required as they would be able to run more efficiently – fewer starts and stops, less ramping up and down and operating at part load. Intermittent renewables are, and always have been, a dead end as even the Guardian has now realised. My main paper explains by a simple calculation which leaves no room for wishful thinking that for the foreseeable future there is no prospect of grid‑scale battery or any other storage technology smoothing out the intermittent supply from renewables over not uncommon multi-day UK-wide becalmings and winter lack of sun, as even the Huffington Post confirms. Assuming the fanatical Claire Perry doesn’t get her way against massive local opposition, any new wind power will be offshore yet the UK already has more expensive, environmentally stressed, difficult to maintain offshore wind than any other country in the world. Recent industry misinformation claiming that the price of offshore wind electricity had fallen by 50% was spread widely by credulous reporters before the Advertising Standards Authority ruled that the claim was not true. Low bids have been submitted for 2021 offshore wind contracts but as it is not credible that costs could have been cut so far so fast, these bids are thought to be a commercial ploy, gambling on getting a better price when the time comes because the bid prices are so completely uneconomic they would have to cancel the contracts, which they could do with minor penalty. Meanwhile, the new Beatrice wind farm in the outer Moray Firth has a strike price of £140/MWh at 2012 prices index-linked for 15 years, three times the market price. On top of that, if this new wind farm is being build to supply rising national demand for electricity then it will have to be expensively duplicated by new conventional plant to take over when there is not enough wind. If it is being build just to save CO2 emissions (why?) then no duplication is needed but it will still make essential conventional plant even more “uninvestable” as well as increasing constraint payments and degrading the stability of the grid when the wind is too strong. Either way our energy bills will go and up and up. Enough of this madness! A simple analysis as done in my main paper shows that any such permutation of electricity generation mix and the concomitant economy-wide decarbonisation along the overall 80% target trajectory is infeasible on many levels: technical, financial/commercial, logistical, environmental and political. A quadrupling of gas-fired electricity supply by 2030 would be logistically and commercially impossible, especially since the politics of climate change long ago made new gas power stations uninvestable. The €820 million 884 MW Carrington gas-fired power station which opened in March 2017 to buck the trend was the first large-scale gas plant of its kind to come online in Britain for four years. Over 100 more such new gas-fired plants (all fitted with very expensive CCS equipment) could be needed to meet the above 2030 electricity generation mix, not counting replacement of retirals. Muddled Labour might not even have enough gas to power all those new power stations as their manifesto promises to ban fracking and North Sea gas could “dry up” within a decade. The muddled Tories are just as bad in a different way as they want to cut back on gas-fired electricity as well as shut down all coal-fired electricity in favour of renewables and international interconnectors in a cheating, irresponsible attempt to meet their precious carbon budgets. It is cheating because a main motivation for using interconnectors seems to be that the imported electricity is sneakily considered “emissions-free” in government thinking: there is no “carbon accounting” for interconnector foreign-generated CO2 emissions in Dukes. It is irresponsible because it will lead to disaster in cold, dark midwinter if, for example, there is no wind and the expected interconnector supply dries up, as could happen when all of Western Europe is becalmed for days on end and France has run down its currently reliable nuclear fleet in favour of green diversification. These weak-minded lemmings need to stiffen their backbones and stand up against the quasi-religious orthodoxy which is leading them to commit such irresponsible and pointless damage to our energy infrastructure. In the context of the 2050 Climate Change Act targets, Labour’s hugely expensive 2030 intermediate stage would provide for decarbonisation of only a very small fraction of the fossil fuel economy, nowhere near the full 80% target. Labour show themselves to be totally unrealistic if they think they could suddenly, by 2030, quadruple our national gas-fired power capacity as well as engineer their profligate, untrialled pipe-dream of a nationwide CCS system to meet their pie in the sky decarbonisation schemes. Implementing all of that would send our energy bills sky‑high yet Labour cynically (or naively) promised to keep energy costs “affordable”. On top of all that, how do they think they could implement a 17% decarbonisation of our high inertia wider fossil fuel economy by 2030, equivalent to electrifying over one third of all road transport and domestic heating, especially when there is no obvious public support for such an expensive, never justified upheaval? There might be a climate change consensus among politicians (only five MPs voted against the 2008 Climate Change Act) but the electorate has been disenfranchised from the debate. We need proper justification and a coherent, believable strategy, not make-believe Greenthinking based on using ruinously inappropriate technologies which is getting us nowhere towards a truly sustainable “low carbon” or even “beyond carbon” economy, for the far distant future when fossil fuels finally run out. It is possible that Labour were just careless in their wording and did not intend the 2030 scope of their manifesto policy to be so sweeping. They perhaps meant 60% of electricity rather than energy from zero-carbon/renewable sources (there is about a factor of five difference) which is what Jeremy Corbyn has proposed (actually 65%). However their 60% energy policy was repeated without qualification by their spokesperson in a recent Guardian article, which was the “gold dust” finding that prompted me to write this email. Either way, it shows that they are like children playing with expensive toys which they really don’t understand and that probably goes all the way back to the architect of Labour’s 2008 Climate Change Act, an English literature graduate Friends of the Earth campaigner and her boss, PPE career politician Ed Miliband. It is said that Tony Blair made this mistake when he signed the UK up to the 2020 EU target of getting 20% of energy from renewables thinking it was for 20% of electricity. Unsurprisingly we are on course to miss these 2020 EU targets. Scottish Tory MP Paul Masterton recently made this very schoolboy error, ironically while trying to promote renewable energy projects and boasting about the big windfarm in his own constituency, when he claimed in the House of Commons that “more than half of Scottish energy consumption is met by renewable sources”. It’s probably more like 10% and as a result of the SNP’s obsession with ineffectual windmills, Scotland is already dependent on imported backup electricity from England to keep the lights on, never mind by 2032 when the SNP would like to phase out petrol and diesel vehicles in Scotland in favour of all-electric, with the double whammy that by that time Scotland’s existing baseload nuclear plants will have been closed down. All the political parties are clearly technically “unproficient” on the vital subject of energy (to put it politely), as shown by the various quotes and policies in this email. It is surely a very sorry state of affairs when technically unqualified politicians are making critical national infrastructure decisions advised by dubiously qualified civil servants who reply to worried constituents using eco-language which would go down well in the environment pages of the climate-deranged Guardian. Do any of our politicians understand the risks and economic damage caused by their technically unviable energy policies? I have listened to MP and MSP debates on fuel poverty where the damaging effects of the Climate Change Act were never even mentioned, as if the Act is an unavoidable fact of life. Or are our politicians happy to meekly go along with whatever the “green energy basket-case” EU tells them to do, or the loony Guardian, or the “follow the money” snake oil renewables industry lobbyists? Do politicians think that getting energy from the wind and sun (with lots of fossil fuel help and lots of real pollution which they don’t acknowledge) just feels so tree-huggingly right to them that there is no need to question its viability? Politicians have been living in a parallel universe (actually a groupthink bubble) of climate and energy fantasy and self-delusion for so long that they are wholly unprepared for the shock of discovering that real world engineering basic facts are showing their fantasy world low carbon nirvana to be unattainable. They shouldn’t be surprised to discover that, despite the climate change propaganda and brainwashing which assails us all daily, they have failed to carry the public with them on their mission to supposedly “save the planet” after the way they have for years insulted the intelligence of their constituents with their clearly unworkable climate and energy policies which have done nothing but worsen fuel poverty and erode business competitiveness, all the while fobbing-off all reasoned objections with their delusional, unjustified assertions, e.g. “To stay reliant on fossil fuels would mean tying ourselves to increasingly unstable supplies which could endanger our energy security” – Theresa May who in 2008 apparently believed that we could run the economy using mainly intermittent renewables (and some nuclear), and “In order to have any hope of keeping the rise in temperature to 2C – let alone meeting our Paris agreement target of 1.5C – we need to keep 80% of fossil fuels in the ground. This can and must be done.” – the gullible (or dissembling) Jeremy Corbyn. 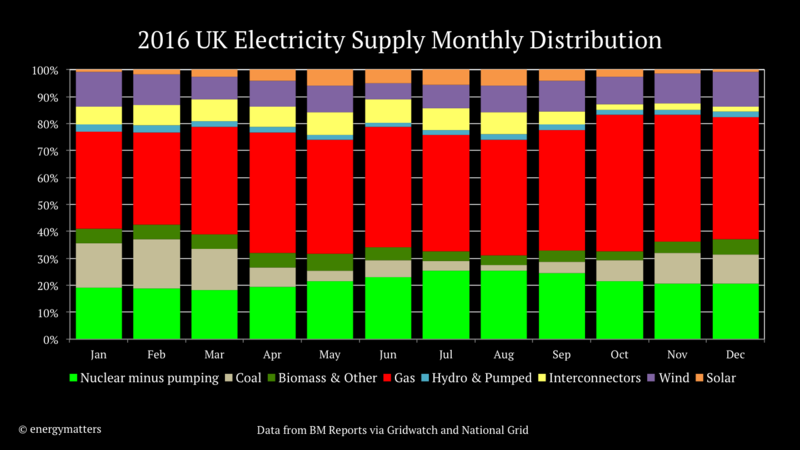 Politicians should worry more about “keeping the lights on” over the next few years as old coal and nuclear power plants get shut down with few new station orders in the pipeline and the national capacity margin already uncomfortably tight. They should concentrate on making the economy more competitive instead of hobbling it with the uncompetitive energy costs of their hugely expensive Climate Change Act distraction which in any case would have negligible impact on the global climate even if CO2 were a dangerous influence (which is unproven and looking increasingly unlikely, see next item) given that most of the rest of the world intends to carry on increasing their consumption of fossil fuels for the foreseeable future and the UK accounts for just 1% of global CO2 emissions. The government frets about low UK productivity but their own calamitous climate and energy policies, which in the main are interchangeable with those of the other parties, are perhaps much to blame. The Tory “Clean Growth” strategy which claims that “The low carbon economy could grow 11% per year between 2015 and 2030, four times faster than the projected growth of the economy as a whole”, the Labour manifesto which claims that “The low-carbon economy is one of the UK’s fastest-growing sectors … It employed an estimated 447,000 employees in the UK in 2015 and saw over £77 billion in turnover” and the SNP boast that Scotland has “over 58,000 low carbon and renewable energy jobs” show clearly that these parties all believe that “green” energy jobs are of themselves a benefit to society. This is the economics of the madhouse as the low energy density nature of these technologies makes them manpower intensive and low productivity, made worse because many only exist through government subsidies or patronage and are functionally redundant discounting their CO2 emissions savings which realistically are of no practical value, especially “bonkers” CCS and wind and solar which have to be expensively duplicated by conventional plant with 24/7 availability, themselves doomed to low productivity through being crowded out by intermittent renewables with higher grid priority. The sad truth is that many of these politically-mandated green jobs and the subsidised green plant that goes with them are just an expensive encumbrance to the productive parts of the economy. This huge redundant overhead (see the £77 billion a year figure quoted above) has to be paid for via our energy bills which creates a double whammy for hard-pressed householders (in Labour parlance “the many, not the few”) who get hit again when businesses pass on their increased energy costs and climate levies by raising the prices of their goods and services. Yet faced with this crisis of low productivity and escalating costs, the government’s latest Industrial Strategy makes no reference to the ruinous Climate Change Act yet witters on about “moving towards a regenerative circular economy”. It also has the presumption to say that we have a “moral duty to address climate change”, the irrational, leftist argument for pointless self-flagellation, particularly unjustified in light of the ongoing 20-year standstill in global temperatures. For Theresa May and Greg Clark to describe such economic self-harm as “an opportunity” is delusional, apparently believing that using inappropriate technologies which do nothing but inflate our energy costs will somehow confer an economic advantage or imagining that we might become a leader in expensive renewable widgets which the world will come clamouring to buy from us. The late government chief scientific advisor Professor Sir David MacKay (a self-confessed greenie) warned years ago of the futility of trying to use wind and solar power as a source of national electricity supply. In his last interview before his untimely death he said that the idea that renewable energy could power the UK was an “appalling delusion”. Instead of heeding his wise words our politicians have embarked on a futile attempt to defy engineering reality, leading us sleepwalking into an EU-style “green energy basket-case” economy. It is as if politicians have been using Orwellian doublethink or some kind of post‑normal thinking process (or maybe just wishful thinking coupled with technical ignorance) to turn a blind eye to this fundamental flaw in their Climate Change Act designs. One only has to look at a simple pie chart (slightly out of date but the only pie chart I could find) showing how dependent our overall economy is on fossil fuels and nuclear power and a simple bar chart showing how dependent we are on them to generate our electricity, especially in cold dark sometimes windless midwinter, to see (and surely understand – again, it’s not rocket science) the sheer futility of trying to power our economy using intermittent windmills and solar panels. Hopefully the government’s recent suspension of any new, regressive subsidies on renewables until at least 2025 is a sign that the penny is finally starting to drop. It was totally dishonest of Labour to present this 60% low carbon energy policy to the electorate as a viable plan, especially when presented alongside their pledge to “ensure that energy costs are affordable for consumers and businesses”. They clearly don’t understand the damage their own policies would cause. However I don’t remember any criticism of the Labour energy plans by the Tories at the time of the election, or since. The Tories are in no position to criticise as the Labour plans are just an intermediate stage of the grander Tory plans. The difference is that the Tory plans cannot be scrutinised as easily (my main paper makes an attempt) because they have not committed to any such infeasible intermediate target. I can but hope that this modest analysis helps them to reconsider. I also suggest that they ditch their Orwellian Newspeak “Clean Growth” slogan because it suggests that life-giving, overwhelmingly natural CO2 is unclean and that growth can best be achieved by using so‑called “clean”, meaning expensive, low productivity, dubiously “green” technologies like wind power (“a sick joke ministers should be ashamed of”) and CCS when unilaterally wasting money and resources on these pointless technologies is mostly a hindrance to growth. This government has dashed the brief hope that sanity might prevail raised by David Cameron’s 2013 moment of epiphany when he reportedly said “we’ve got to get rid of all this green cr@p”. The November climate summit in Bonn achieved next to nothing according to their own press release. The December “One Planet” climate summit in Paris was also little more than a talking shop, once again demonstrating the establishment’s detachment from (engineering) reality and most notably with President Macron saying that “we are losing the battle” against alleged man-made climate change and that as a consequence of not making even more impossibly onerous cuts in CO2 emissions, Pacific islands could disappear beneath the waves within as little as 50 years. Macron is a typical Western politician who likes to flaunt his virtue pretending to be “saving the planet” when in reality all he is doing is stoking irresponsible, pseudo-scientific climate alarmism to promote highly regressive unworkable Greenthinking “solutions” which inevitably do nothing for the climate but cause great economic harm, with the poorest in society suffering the most. He is a propagandist who is trying to scare the general public by shamelessly conflating a natural phenomenon we can do nothing about with a postulated, unproven man-made problem, ignoring all the scientific and observational studies which show that these islands are not at risk from human influence. He also ignores the common sense evidence of the ongoing 20‑year standstill in global temperatures which all by itself has put a huge question mark against such tedious “Chicken Licken the sky is falling!“ climate change scaremongering. What’s more, Macron’s “worthless” Paris Agreement is certain to fail on scientific, financial and political grounds. On science, because it has been calculated from the UN’s own figures that all the painful 2030 CO2 emissions reductions pledged under the agreement will have only a 0.05ºC impact on global temperatures by the year 2100. On finance, because it has been estimated that $58 trillion would be needed to meet the UN’s global warming goals. On politics, because the agreement is totally unbalanced, with the vast bulk of the world’s countries exempt from reducing their emissions. Yet all the politicians (bar Trump) rave about how wonderful an agreement it is! Who do they think they are kidding, other than themselves? Or are they all dissembling? It is worth examining Macron’s disgraceful sea level rise scaremongering in some detail as climate alarmists get away far too easily with stoking confusion and unfounded alarm on this topic, aided and abetted by the complicit mainstream media. 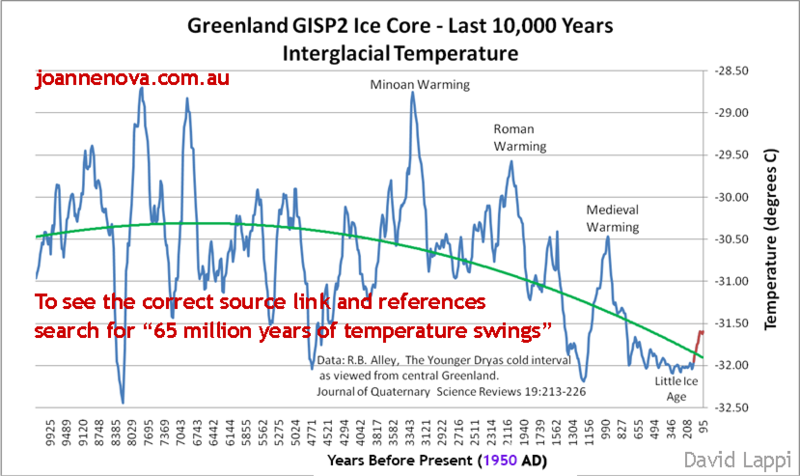 Glacier ice has been melting for the last 11,500 years of our precious ice age interglacial and in that time sea levels have risen about 300 to 400 feet (obviously nothing to do with alleged man-made global warming). 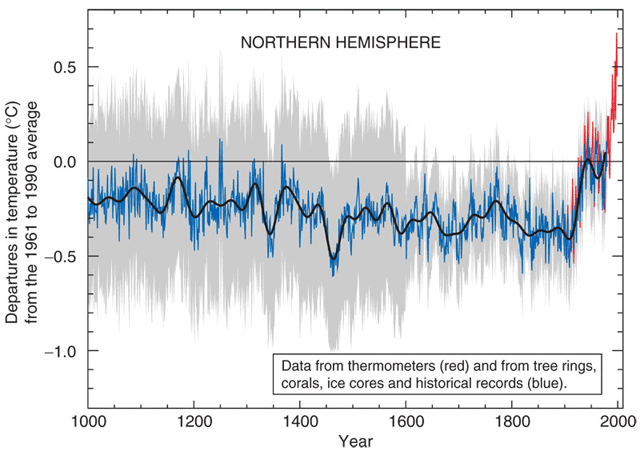 Global temperatures have fallen over the last 8,000 years which has slowed the melting. The current average rate of sea level rise is thought to be about six inches per century, with negligible rate change in recent times as man-made CO2 emissions have risen, and with this renowned expert saying the rate is no more than 2 to 3 inches per century, either figure making a mockery of Macron’s intelligence-insulting scare. The fact is, however, that current global temperatures will melt more of the ice and there is nothing we can do about it other than gradually adapt as necessary. A further rise of 20 to 30 feet is possible, e.g. in the extreme event that the 10,000 feet thick Greenland ice sheet were to melt completely. Assuming the UN IPCC’s worst-case prognostications (which have been disputed by many independent studies such as this and this) of an unbelievable 5.8ºC of man-made global warming by 2100 do not come to pass when all we have had since 1950 has been at most 0.5ºC (a figure much exaggerated by Climategate retrospective adjustments from this very different raw original) or perhaps, no doubt inconceivably to blinkered climate catastrophists, none at all (explained below), cutting greenhouse gas emissions is not going to prevent the rise. 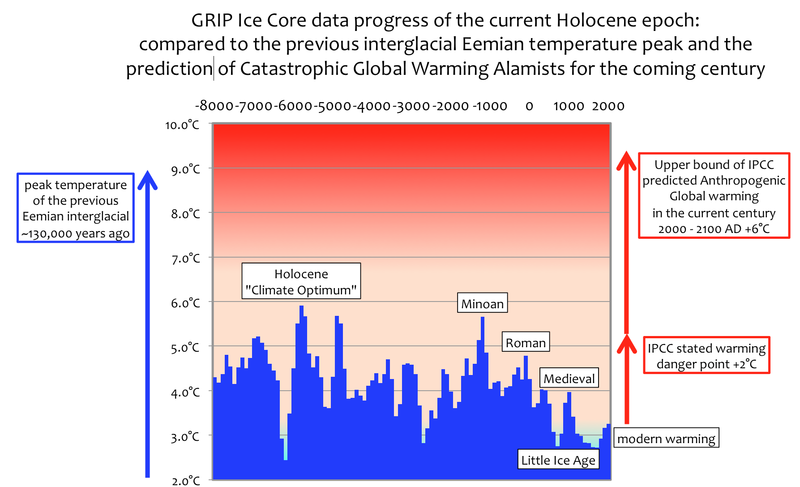 The only thing that will stop it is another little ice age (see below). Change will be gradual as this study shows that the Greenland ice sheet was smaller than it is today 3,000 years ago when global temperatures were much higher, evidently without dire consequences. The climate was also more congenial 1,000 years ago when for nearly 500 years from about the 10th century Vikings lived and thrived in Greenland during the Medieval Warm Period. They abandoned their settlements during the subsequent 400 year Little Ice Age which was so cold that Londoners could hold ice fairs on the frozen River Thames. The last ice fair was held in 1814. Meanwhile, Antarctic sea ice has been increasing for at least the last 40 years and Arctic sea ice is recovering from its 2007 low. Climate alarmists like to discuss Arctic sea ice trends from the start of satellite measurements in 1979 which coincidentally and conveniently for them was a modern high for the ice due to the global cooling which occurred between the 1940s and 1970s (made to look less severe by Climategate retrospective adjustments, confirmed by the data in this 1975 scientific archive). To put things into perspective, this graph shows the huge expansion of Arctic sea ice during the Little Ice Age and also shows that in the warmer 1930s and 40s when temperatures in Iceland were similar to now there was still more sea ice than during most of the Medieval Warm Period. To allay the worries stoked by climate alarmist propaganda, melting sea ice has no impact on sea level rise (like ice cubes melting in a glass). And climate propaganda Greenland ice sheet scare stories are easily rebutted, e.g. here and here. Returning to Macron’s main theme, why should we need to “battle” against a politically contrived problem which remains unconvincing, unproven and as yet indiscernible? This is an appropriate time to look back on the origins of the politicised man-made global warming scare as described in two new books, the first by science historian Bernie Lewin and the other by climate analyst Bob Tisdale. They recall how at the time of the first UN IPCC meeting in 1991 the scientists were adamant that they could find no human influence on global climate. This was very frustrating for the politicians who were already itching to start regulating the global consumption of fossil fuels for reasons which remain unclear to this day (they never talk about sustainability, just climate change). The second UN IPCC meeting in 1995 resulted in exactly the same conclusion at its first draft stage. However scientific arms were twisted behind the scenes at the encouragement of the US Department of State, probably at the behest of Bill Clinton and his climate fanatical VP Al Gore (see Margaret Thatcher below), and a young American lead author was prevailed upon to bend to the will of the politicians and change his scientific stance. 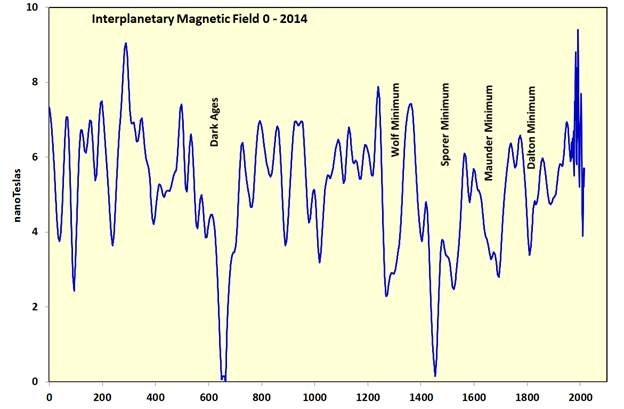 The controversy centred around a dubious graph which when plotted with 8‑year old data showed an alleged “human fingerprint”. 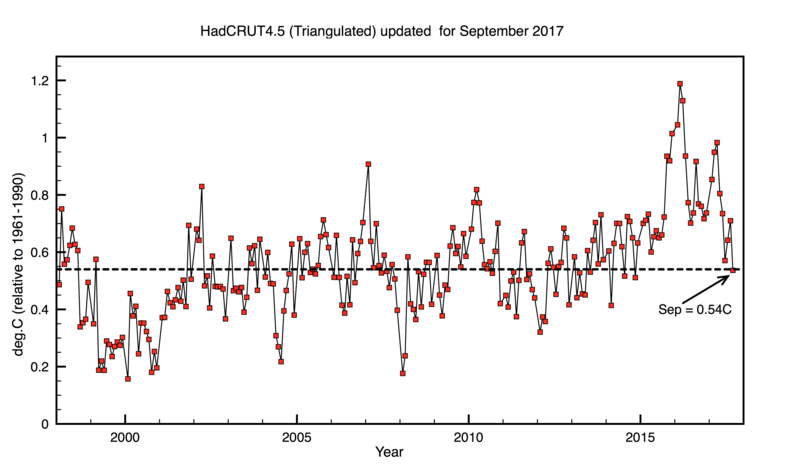 The problem was that the tell‑tale pattern disappeared when the latest data was used but the lead author nevertheless flagrantly declared a “discernible human influence on global climate”. 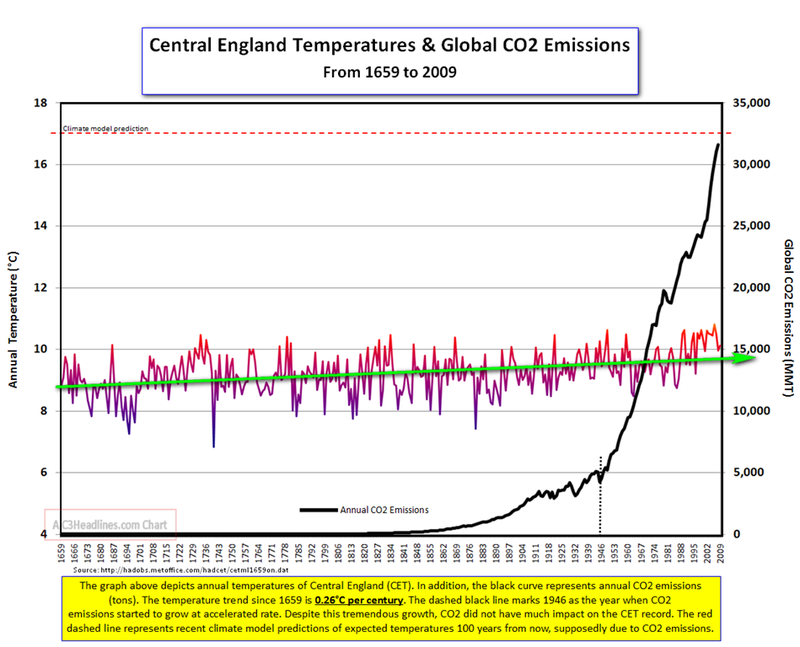 The UN IPCC politicians used this flaky scientific evidence obtained under duress and disputed by the other scientists to kick-start their politics-driven, selectively biased man-made global warming scare. The scientists have been in the pockets of the manipulative politicians ever since as demonstrated by the shocking climate science skulduggery and complicity to deceive which came to light through the Climategate emails leaked in 2009 from the University of East Anglia’s Climatic Research Unit, a key hub of UN IPCC climate science. All of that blatant chicanery was disgracefully “greenwashed” by establishment inquiries. Twenty-three years later, where is the iconic poster child image of this supposedly discernible human influence? 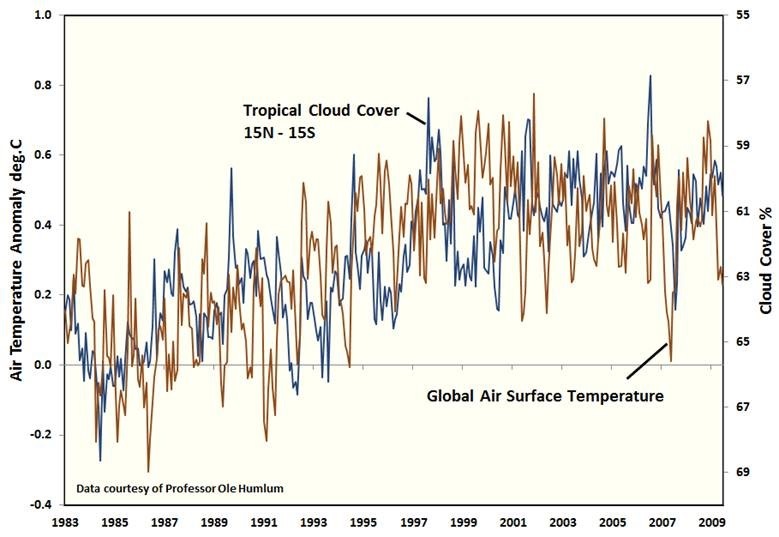 The theory of CO2 greenhouse gas warming dictates that it should create a signature tropospheric “hot‑spot” but this has never been found: if it had been we would know all about it. For years the desperate UN IPCC used the unconvincing hockey stick graph as an icon until it was finally proved to be a fraud, no thanks to the climate scientists who refused to make public their flawed data. Climate alarmists have often used a supposedly distressed polar bear as a proxy icon for man-made global warming but this has backfired on them as the polar bear community is thriving. The 20‑year standstill in global temperatures since 1998 despite steadily rising atmospheric CO2 means that, discounting recent short-term natural fluctuations (now cooling), there has not even been a rising global temperature trend since last century. It also means that every temperature projection made to date by the UN IPCC’s climate models has been consistently wrong. What’s more, the trusted and relevant UAH satellite temperature chart of that long ago brief warming spell of the 1980s and 90s, incidentally much shorter than the 30 year period climate scientists say is needed before declaring a climate trend which in this case they disgracefully chose to curtail because the politicians couldn’t wait to start their man-made global warming scare, the only brief period of sustained global warming in the last 70 years – and climate alarmist politicians who have any concern for their hard-pressed constituents should take cognisance of this hysteria-calming, easily displayed fact – shows no trace of the predicted CO2 global warming at a slow but steady rate of increase of about 0.2ºC per decade, just short-term random fluctuations which could only have been due to natural causes, most notably the huge double jump of the 1998 El Nino/La Nina/El Nino. A compelling alternative explanation for the global warming of the 1980s and 90s is that, for whatever reasons such as increased solar magnetic intensity and reduced tropical cloud cover, a series of sunlight-fuelled naturally-warming El Ninos predominated over the subsequent cooling La Ninas. If so, that would mean there has been no man-made CO2 global warming in the last 70 years and therefore that there has never been any man‑made global warming as atmospheric CO2 levels before 1950 were too low (as even the UN IPCC concedes), and therefore that the only global warming we have enjoyed has been the approximate 0.8ºC of natural global warming since 1850 which mercifully lifted us out of the Little Ice Age, the worst cold period of our Holocene interglacial which also suffered far worse extremes – storms, floods, cold and famines, described here and here – than we have experienced in recent times, which according to Emeritus Professor Richard Lindzen would have been due to (fifth bullet) the then increased temperature differential with the tropics. Yet my dangerously deluded MP “dares to dream” (25 minutes in) that we might “slow down, stop and even reverse” what he believes without basis is dangerous man-made global warming, as if sufficient self‑flagellation could conceivably make such a reversal possible, were that the case. His thinking mirrors the brainwashed Cambridge University undergraduates who recently debated “This House would rather cool the planet than warm the economy”. In contrast, Professor Lindzen thinks that the CO2 greenhouse effect increase in global temperatures will be of the order of 0.3ºC by around the end of the century which he says is nothing to worry about as it will be indiscernible in among the natural fluctuations of the climate (see Lord Lawson below on adaption). Looking even further ahead, there is a logarithmic (exponential) drop-off in the CO2 warming effect as its concentration rises. “The global warming scam … is the greatest and most successful pseudo-scientific fraud I have seen in my long life as a physicist”. In the absence of “global warming”, all we get nowadays from politicians is uninformed hysteria about supposed “man-made climate change” effects such as hurricanes and wildfires which can all be discounted as they are easily rebutted factually and are contingent on indiscernible sustained man-made global warming – which in any case should in theory reduce extreme weather events, i.e. the reverse of the well-documented severe conditions of the Little Ice Age and even the unsettled, crop yield averse conditions of the global cooling from the 1940s to the 1970s – along with other unsubstantiated, mostly unscientific assertions such as the desperate claim made by then climate change minister Ed Davey, referring to the “pause” in global temperatures, that “the ‘missing heat’ is hiding in the oceans”. 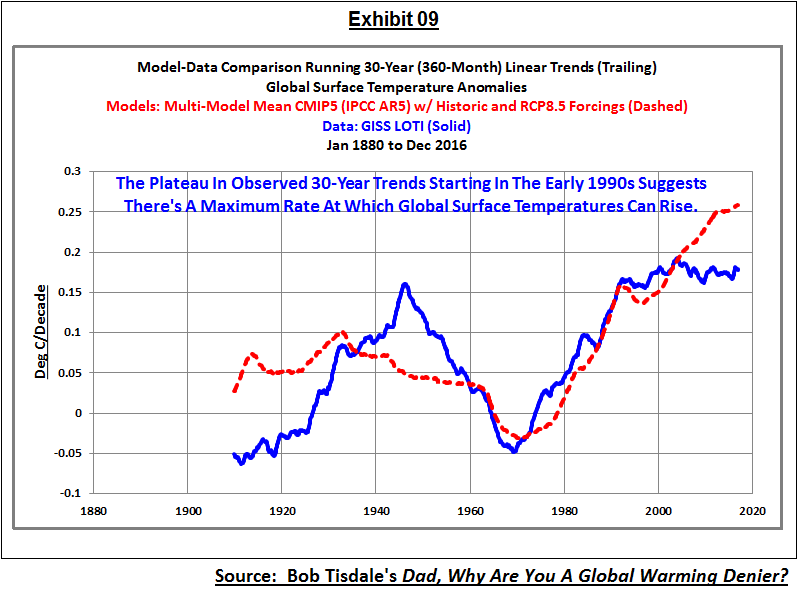 The complete surprise of the 20‑year “pause” in global warming shows clearly that the unvalidated climate models on which the climate change scare is so reliant are seriously flawed. They run far too “hot”, i.e. their projections are grossly exaggerated, as shown by this simple graph of climate model projections versus actual temperatures. These exaggerated projections result mainly from the modelling of hypothetical, unverified positive feedbacks which are disputed by many independent scientists. Common sense dictates that such unnatural feedbacks are impossible because if such an aberration of nature actually existed, it would have turned the Earth into a hot, waterless planet like Venus in the distant past when CO2 levels were often much higher than now, which obviously did not happen. The entire establishment turns a political blind eye to the hopeless performance of these climate models which can only be described as GiGo “Garbage in, Garbage out” while they shamelessly continue to quote their unreal off-the-scale projections to try to scare the general public. Yet anyone who questions the establishment climate orthodoxy gets dismissed as a “climate change denier” for the heresy of suggesting that the poorly justified climate change risks and fears stoked up by the establishment seem somewhat exaggerated or that their ruinously inappropriate methods of supposedly “tackling climate change” are leading us into a hopeless energy supply cul‑de‑sac when all the empirical evidence indicates that man-made CO2 emissions have as yet no discernible impact on global temperatures. The energy supply cul-de-sac refers to attempting to decarbonise using expensive, intermittent, low energy density, environmentally damaging renewables which cannot operate without the support of fossil fuel supplies for essential balancing and grid stability control; which have to be expensively duplicated by conventional plant to take over when there is not enough wind/sun; which as more are deployed degrade the efficiency and stability of the power grid and reduce the commercial viability of essential conventional plant which are forced to remain idle for longer; which can only be deployed to a limited scale due to basic engineering constraints; and which achieve nothing like the system-wide CO2 emissions savings claimed of them, which explains why the establishment has never dared to quantify their net life-cycle CO2 savings at the high deployment levels they want to achieve. In fact, global investment in these expensive, ineffectual renewable energy technologies has stalled since about 2011. Unfortunately most of our politicians and the wider climate establishment seem not to have taken this on board. It is no good politician falling back on the faked “97% consensus” on climate change, explained in my main paper. Incidentally one of the main players in that fraud writes regularly in the Guardian under a 97% consensus mantra masthead, which tells you all you need to know about the Guardian’s shameless, desperate climate change propaganda. Nor should they try to fall back on the precautionary principle when the cost of the “insurance” is so much worse than the as yet indiscernible problem, especially given that unilateral action on our part is futile as under the Paris Agreement the exempt developing countries, including sub-continent sized China and India, are not going to stop increasing their fossil fuel consumption. For the sake of their hard‑pressed, energy poor constituents, politicians need to smell the coffee and set up an urgent review of their untenable, doctrinaire climate and energy policies – or are they not bothered that the climate models used by the UP IPCC’s politicised climate scientists are so blatantly flawed? Better still, given that (i) despite all the sacrifices made so far we have barely scratched the surface of implementing the Climate Change Act, mainly by picking the low hanging fruit, and (ii) with Lord Deben fretting that we will fall short on our next emissions targets unless even more draconian, self-flagellating measures are taken, and (iii) as one of the explicit aims of the Act was to demonstrate strong UK leadership internationally in order to encourage other countries to follow our lead but this has patently failed as exemplified by the “fantasy” Paris Agreement, they could use some common sense and simply repeal the ruinous Climate Change Act without further ado. After all, no other country in the world has imposed such an onerous legally binding burden on itself, especially a policy dreamt up by technically unqualified ideology‑driven socialists, shown by their made-up concept of “climate justice“ which in practice is highly regressive, not that they care about that just so long as they can feel self-righteous about their (muddled) virtue-signalling policies, never mind “the many not the few”, aided and abetted by the “economy cratering” Lib Dems who blithely voted to increase the original 60% decarbonisation target to 80% (my ex MP Danny Alexander boasted to me about it). It was understandable that the Climate Change Act had to be retained during the Lib Dem coalition but why continue with it now when the passage of 10 years has shown it to be unworkable? Germany’s much vaunted, hugely expensive “energy transition” is turning into an “embarrassing fiasco” and they have dropped their EU 2020 climate targets. The EU’s energy policies are “worse than stupid” yet we could be lumbered with their autocratic climate directives for years to come with fines for missing their mandatory targets unless we make a clean Brexit. Politicians need to rejoin the uncompromising world of science and engineering reality, unpick their comfort blanket of misguided climate change certainties and deconstruct the complex web of fiction they have built up around alleged but indiscernible man-made global warming. It would be great if we could ban public policy use of the un‑prefixed weasel phrase “climate change”. Lord Lawson famously said “Global warming orthodoxy is not merely irrational. It is wicked.” As he concludes in his book An Appeal to Reason: A Cool Look at Global Warming, the only sensible course of action on climate change, as with the melting of glacier ice, is to adapt as and when necessary. Our politicians could show real international leadership by withdrawing from the unworkable Paris Agreement on the grounds that it has been a political fix from the start, nothing to do with science and based on climate models which are clearly not fit for purpose as this expert testimony to the US House of Representatives recently spelled out. 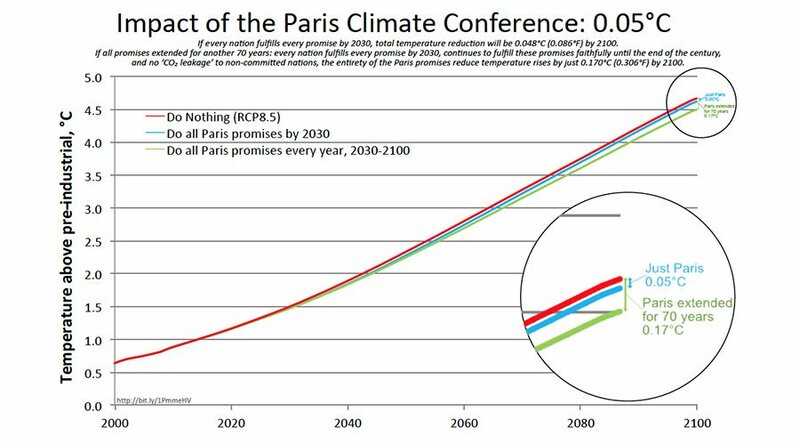 As it currently stands the Paris Agreement is an exercise in futility, as illustrated by this dramatic graph from a well-known climate policy expert, but there is no prospect of it being re‑negotiated. The unaccountable, untrustworthy UN which cobbled together this intelligence-insulting “farce” of an international agreement does not deserve our support. We should give priority to looking after our own interests. The Americans rejected Kyoto, which achieved nothing, and now Paris yet paradoxically they were the only major country to meet the Kyoto standard of emissions reductions. “The doomsters’ favourite subject today is climate change. This has a number of advantages for them. First, the science is extremely obscure so they cannot easily be proved wrong. Second, we all have ideas about the weather: traditionally, the English on first acquaintance talk of little else. Third, since clearly no plan to alter climate could be considered on anything but a global scale, it provides a marvellous excuse for worldwide, supra‑national socialism. Britain’s then Foreign Secretary, Robin Cook, has observed: ‘There is no greater national duty than the defence of our shoreline. But the most immediate threat to it today is the encroaching sea.’ Britain has found, it seems, a worthy successor to King Canute. With real world global climate indicators such as sea surface temperatures falling since about 2016 and the progression of natural solar and oceanic cycles suggesting that the world could experience global cooling over coming decades, politicians should perhaps go back to worrying about the next little ice age and the severe storms, floods and bitter cold that could bring, or even the 1970s scare of the next ice age, illustrated by this scary image of our precarious interglacial. Bring on global warming! Fortunately past ice ages have taken thousands of years to form. The thought of such cooling is surely enough to convince even those irrationally wedded to windmills that trying to survive using energy sparse intermittent renewables like wind power is not a sensible idea. The security of UK gas supplies was exposed in December by multiple supply chain problems. Our already limited gas storage capability has already been reduced by the closure of the Rough gas storage facility in early 2017. A recent study by geologists from the University of Edinburgh concluded that there are “only 10 years of North Sea oil and gas left”. We are severely vulnerable and no amount of additional intermittent renewables or pie in the sky battery storage could conceivably be of any help. Yet the UK has so far achieved zero fracking of natural gas which, if well-managed and successful, could secure our gas supplies for hundreds of years. Fortunately the results of test drilling look very promising. Fracking has already transformed the USA into the world’s largest producer of oil and gas and its cheap energy costs have rejuvenated its industries and are opening up a huge competitive advantage over self-harming renewables-obsessed countries like us. For many UK politicians, especially those on the left, it is apparently not a problem to be dependent on gas imports from countries like Qatar and Russia (as well as countries like Norway and the USA) but to exploit the huge natural gas bounty beneath our own feet is beyond the pale. Fracking has been ruled out in Labour’s 2017 manifesto and is also opposed by the Lib Dems and the SNP, the latter against the advice of their scientific advisors. These eco-dogmatists are being irresponsibly reckless with our national energy supply as well as passing up a great opportunity for industrial regeneration. Finally, I am reminded of the totally failed Met Office prediction of 18 years ago that “winter snowfall will become ‘a very rare and exciting event’“. During this freezing January our electricity supply was at times on a knife-edge. Gas sometimes supplied a danger zone 60% or more of our electricity with coal taking the fossil fuel total to over 70% and nuclear sometimes taking the total up to about 90% while wind and solar barely registered above zero. The government was lucky because (i) there were no major plant outages, (ii) the only immediate manifestation of the gas supply chain problems was a price spike and a couple of small suppliers forced out of business and (iii) the month was mostly very windy with the wind electricity supply only occasionally falling into the doldrums. During such cold weather gas is obviously indispensible for heating most of our homes. What will it take for our anti-fracking zealots to understand that gas is essential to our wellbeing – large numbers of pensioner deaths from hypothermia and rolling blackouts with the economy grinding to a halt? How do Labour think they are going to procure the gas for their (presumed) 2030 quadrupled gas-fired, CCS abated electricity supply? How do the Tories think they will keep the lights on in cold midwinter when there is no wind or sun after they have run down our gas-fired electricity supplies and closed down all our coal power stations and then the international interconnector supplies go AWOL? How do the insular SNP think we could cope without gas and nuclear power, especially when Scotland is already dependent on imported backup electricity from England to keep the lights on when the wind doesn’t blow? 3 Responses to Do Politicians ever listen? But I’m pessimistic of even major power cuts changing attitudes. Probably any outage will coincide with 1 or more major power station going offline, and the green propaganda machine will blame that. It’s already happening in Australia. I recently met 2 Ausy women who told me they believe in man made global warming, without giving me any sensible reason why. A few hours later they complained that they’d been having power cuts. They have (non-scientific) degrees but haven’t made the AGW- powercuts connection! Dr. Alexander Cannara is as scornful of IWT as you and I are, but see his presentation at TEAC6, on “Oceanic Acidification, AGW’s Evil Twin”. Carbon dioxide in water can become a poison to organisms that depend upon calcium carbonate of their shells being insoluble in water. Carbonic acid turns it into bicarbonate, which dissolves in water. A sufficiently high concentration of CO2 causes human asphyxiation, but in the oceans it is an actual poison to mollusc larvae and to the zooxanthellae that are essential to coral growth. CO2+H2O H2CO3 ; carbonic acid. Carbonic acid can produce either the bivalent CO3– , carbonate ion, or the monovalent HCO3- , the bicarbonate ion. At pH=8.2, the carbonate dominates, and oceanic organisms can make calcium carbonate, CaCO3, which is insoluble in such water. But at pH=8.0, although the water is still technically still slightly alkaline, it is not alkaline enough. Limestone caves were carved out by rushing dilute carbonic acid centuries ago, and stalactites, stalagmites exist because CO2 + H2O (rain) dissolves CaCO3 as its bicarbonate, Ca(HCO3)2 . Rain seeping through the ground evaporates when it reaches the cave, leaving a tiny particle of CaCO3. The oceans at present have gone from pH 8.2 to 8.1, and for as long as the CO2 in the atmosphere stays at or exceeds 400 ppm, they are likely to kill all the corals by fifty years from now.